If you are looking to add some fun, colour, interest and activity to your next event you can’t beat my big, colorful balloon twisting. Are you planning a kids party or event. 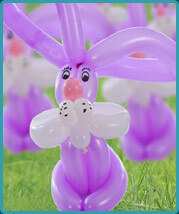 I specialise in supplying high quality balloon modelling entertainment at kids parties and corporate events. 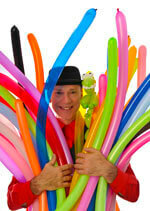 I can guarantee this, your corporate entertainment will be brighter and happier with my incredible balloon creations. When I hand out my amazing creations at you company event it creates an instant visual impact that can be seen from across the room. It ‘will’ get people talking. They ‘will’ feel happier. They ‘will’ be laughing and smiling It is the perfect ice-breaker. People find it fascinating to watch the balloon creations being made, “what’s it going to be?”…. I never tell until the very end when the whole balloon creation seems to come together as if by magic. Your company event will be brighter and happier with my amazing colorful balloon figures. She is a loveable trickster who can juggle, spin plates, circus skills, do magic and likes to dance as well. She has been performing professionally for eight years. She is accomplished in clowning, improvisation, physical comedy, character comedy and character acting, stilt walking and living statue. Her range of skills also includes: acrobalance, juggling, balloon sculpting, pocket magic and lasso.